RETIRED MEMBER - PLEASE GO TO HTTPS://GRADIVIS.COM/PROJECTS TO SEE THIS WORK LOG! The aim of this mod is to shake up the norm of aluminum-silver G5/Mac Pro mods by employing a darker theme for my Mac Pro. I want it to be clean and non-flashy, yet still have the gravitas to make people stop and take a second look. This list is more for my personal benefit than anything, but will give you a good idea of what's to come! Despite being mostly empty, the case had only one small scratch on it, and the important parts like the front panel and shelf were included, so I had absolutely no reason to complain. I knew that I wanted this mod to stand out. I'm always encouraged to see the sheer volume of G5/Mac Pro mods floating around various communities, and after being inspired by the Gunmetal G5 project from ToddFX on G5Modders (and contacting him to find out how much he paid for his anodizing), I decided to make some phone calls around town and see how much the cost of anodizing a Mac Pro would annoy my wife. She would undoubtedly (and not incorrectly) think that it was superfluous. Well, "superfluous" is not in the vocabulary of most modders, and I was delighted to hear back from "Anodizing Specialists" in Ohio that, yes, they would be interested in me coming down to talk things over. Delighted, I took a trip to the shop to talk with the VP of operations. Being an aluminum guy, I would like to think that he appreciated the hunk of his metal of choice almost as much as I do. Sitting in his office he pulled out some color samples, and I chose a dark gray. I had toyed around with black and even white, but this is to be my last computer case for a little while, and dark gray is my favorite color. After going over the case with magnets, he pointed out the parts that needed to be removed and told me to come on back when I had it disassembled. He very kindly gave me permission to photograph and document the process for informational purposes, which will be released in a forthcoming article on G5Modders.com, and of course will be included in this worklog. This is perhaps the most intricate and difficult case that I have ever worked with, and that's including old server towers from the 90's! With this more than any other case, TOOLS ARE EVERYTHING. If you don't have the right tools, you're going to have a tough time doing things efficiently, and you'll probably end up cussing. Before picking up the tools above, I was close to giving up twice. "It's not worth it", I thought to myself on those occasions, "just do a regular mod". Once I buckled down and bought the tools, things were MUCH easier, if only slightly faster. I'm going to hazard a guess that there are around 80 screws that you need to remove for full disassembly, although considering everything I had to take out, that could be an underestimate. The above screws are the biggest pain the neck. Being so close to the bottom of the case, regular screwdriver handles are simply too big to have space for your knuckles to turn, and of course Apple uses that blue loctite stuff on all of their screws, so pliers just don't cut it most of the time. Once I had removed all the screws (including the hidden ones…sigh) I carefully pulled apart the handles from the shell. Now I'm not sure if I did it correctly, but using some fabric in between the two parts, I pulled the handle assembly away from the shell, and slowly slid up out and over, taking care not to scratch anything! I don't have pictures of this step as it takes both hands, but I'm here to help if anyone needs guiding! Steve Jobs meant it when he said he didn't want people rooting around inside Apple products. Finally I removed anything that was not made of aluminum, including all I/O plastic and EMI shields, and several screws and a few other bits and bobs here and there. Pics to come of the thing totally apart! Hopefully I'm dropping this case off to be anodized in the next few days, so we won't have to wait too long for a pic update. I'll have some mod plans drawn up soon as well. Thanks for watching! And that has been an awesome deal for that case. You should have seen me when the eBay listing was ending - sitting there very nervous hoping no one else found it, ready to bid up to $100!! Yeah that is an AMAZING deal. Jealous. So, since you are going for a darker color scheme, you should totally make some backlit apple logos for the side. Similar to apple laptops! So, since you are going for a darker color scheme, you should totally make some backlit apple logos for the side. Similar to apple laptops! I did it but inside the case, first on a plexiglass and then changed for a G5 case door cut at the shape of the opening and backlight in 3D. Btw, nice job WhatThech, it's a hard work and a lot of patience. Remind me when I separate the inner and outer parts of a MacPro case with feet badly bended and put together the Inner part inside an outer part of a G5 case. Thanks so much! It is a lot of hard work, but I know it will be worth it. I think I will be doing a video tutorial on a spare G5 that I have, but I may need to recover first from putting it back together first! SO my question is about the motherboard. I am gonna take a wild guess here and say that the MacPro motherboard is just as wacked out as the G5 motherboard and conforms to no standards - correct? Are you going to remove the binding posts that are there now? If yes, will you relocate them? If so how will you affix them? Using a MB tray instead? Will you be anodizing that as well? Which tray? I imagine that this is all in the a fore mentioned "plans" that you are drawing up so if I'm jumping the gun, just tell me to hold my horses! I am always curious how people mount the new stuff in the old and I can usually get some good ideas for future reference from others ideas. I think I will cut into the back panel to allow for the original Mac Pro fan and mount to be used, but I'm not entirely sure just yet. It will definitely be anodized - I have already removed the rivets and it's disassembled and ready for the shop to dip it! I probably should cut it before I have it anodized - I forgot I had another dentist appointment tomorrow, so anodizing will have to wait until later in the week. This gives me a little bit more time to measure and cut. As I mentioned earlier, I really don't enjoy cutting metal, but I can't put it off much longer! I guess I'll have a motherboard tray update tomorrow once the anesthetic wears off! *scoffs* just happen to have this lan li tray lying around... right under the three G5s and the two nearly working Porsche 959s that just happen to be in my garage! I kid! I kid! I actually like the idea of cutting the back of the tray to fit the existing fan hole, rather than the other way around - less cutting of the original case, and keeps the case more original. So one more question - not gonna try to adapt the original hot swap stuff for your new HDDs? I have no idea about any of that as I have never even seen the inside of a MacPro, so I don't know the logistics of all that - but surely there is some kind of system that can at least reuse the location if nothing else - I always thought that was a good place... all in a row and mostly outta the way. OK - I lied - one more question - does the MacPro have that clear plastic shield liek the G5 does? If yes, are you goingto reuse it? what is the shape of that? If my measurements are correct, I think I can just about fit it by removing the original PCI brackets and cutting the original I/O area. I may have to include part of the outer aluminum (the part I was going to cut in the image in my other post), simply because the Mac Pro has one more PCI slot than my Lian Li tray. Fingers crossed! For the HDDs, I would LOVE to use the original system which is very VERY nice, but my case did not come with the HDD sleds (the four trays you see on a stock Mac Pro). They are pretty expensive to get individually (well, multiplied by four anyway), so I just thought "forget it" and decided to go an alternate route. I'm throwing around a few ideas, but the one I like most is using a 2.5" HDD cage (like this) and either putting it under the optical drive (as in where the second DVD drive normally is) or attaching it underneath the top shelf where the hard-drives traditionally go. That's probably not the cage I will go with - it really depends on what looks the best/can be easily modified vs. what I can afford when that time comes. In the mean time, I sold two of my 3.5" hard-drives and purchased a couple of 2.5" storage drives instead to go along with my SSD which will be the OS drive. Finally, I don't believe that the Mac Pro has a plastic baffle. Instead they opted to have outer shields that direct the air flow in much the same way, albeit with a little more aluminum style. Enjoying the feedback and questions very much! interesting with the shield (or two shields) at the front and the one over the CPUs. I always liked the G5 method because if you want to have a window on the side of your G5, you just take the side panel off and the clear plastic keeps the airflow going over the important stuff. That HDD caddy looks pretty sweet - especially if you are going to all 2.5" drives. Since you should have quite a bit of room in there, it'll fit pretty easily. Bummer about not coming with that sled stuff - but for 30 bucks, ya cant beat what ya got eh? Definitely a lot more aluminum extras in the MacPro. How much of that extra stuff did the rig come with? and if it came with any - I'm gonna take a WAG and say you are anodizing them too? The rosewill 2x2.5" hotswap bays can be fully disassembled leaving just the sata backplane connector.Making your own hd sled is pretty straightforward though knowing how the bays are it would be easier to have the sled below the hd and curving up instead of how apple has it above and curving down. Here are a few photos of the backplane. I'm not too worried about keeping the stock layout to be honest - the only thing I REALLY want is the PSU cover which is hard to come by seeing as it was part of the PSU itself! The more I look at things, the more I want to cut as little as possible. Below are some plans for the rear cuts. Basically I am doing with my Lian Li tray what The Laser Hive products do; keeping the original PCI brackets. If all works out, this will allow me to keep the stock fan grill and the sturdy PCI brackets...here's to hoping! Well, a small update. I cut the Lian Li motherboard tray which already had space for the PCI brackets so that it would be close enough to the back of the Mac Pro case to use the stock PCI brackets. If you don't have to make small cuts, the EZ-lock metal cutting discs are by far the easiest way to go. Not perfectly straight, but with a little bit of filing it will definitely do! My only concern with the motherboard tray is that it raises everything up by about 5mm, which I believe is around the height of the original motherboard. This means that if I use regular motherboard standoffs on top of the tray for the mobo, it will be too high to use the PCI brackets comfortably. Now on my first ever G5 mod, I combatted this by using standoffs on the PCI bracket itself so that my video card was screwed into a standoff, that was in turn screwed in to the PCI bracket, but that was a quick and dirty fix that is far from ideal aesthetically speaking. What I might do this time is cut an insulating sheet of plastic to size, and then screw the motherboard directly to the tray without any standoffs, removing the extra unwanted height. If I use the proper type of plastic does anyone know of any objections to doing this? I saw someone do this with an all-wood custom case, so I'm guessing conductivity (and the resulting shorting out of components) is the only concern here? It's what was done to the G5's PSU and as long as the plastic insulates (which it should) it will be ok. All you are doing is safeguarding against shorts. metal, plastic, whatever... as long as you line it up with the holes, you're fine. Don't forget the original G5, and most other original systems, have metal binding posts... this, in theory, helps to ground the case with the motherboard. Totally not necessary as the ground will be carried thru the 24pin ATX cable back to the PSU. I found a post somewhere (have no idea where now of course) where somebody used the hexagonal clear Bic pen shells as standoffs. I even went so far as to buy a pack and test it out. I came to the conclusion that I would just reuse the original G5 standoffs. This might be a time where you could use that trick since you have height issues using an additional motherboard tray. It seems like only yesterday you started this, and you've already got a pretty good start. I almost went with a Mac Pro case before I found the G5, so this mod is really interesting to me. 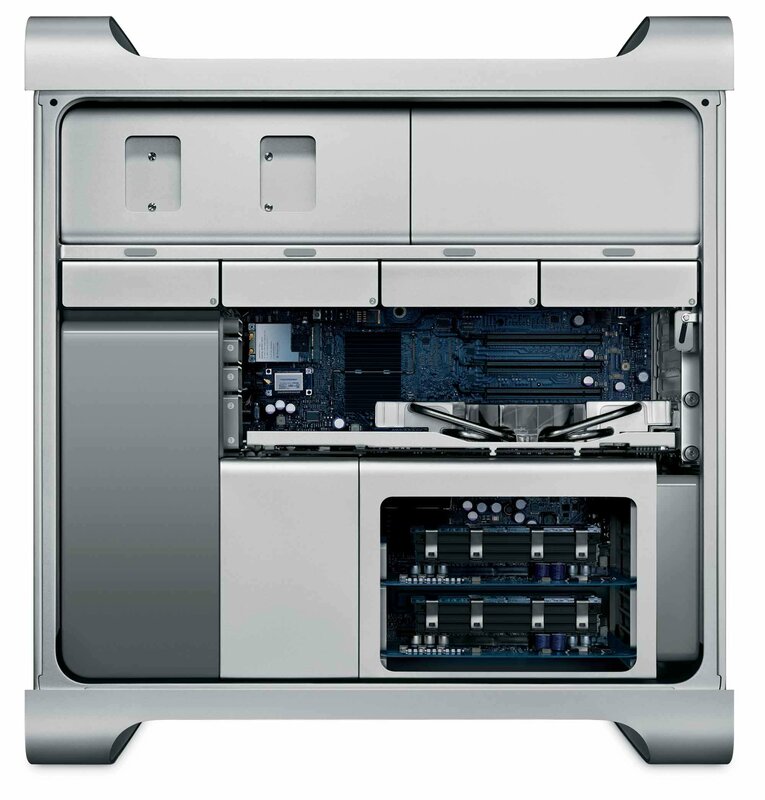 The Mac Pro is at the same time very familiar (coming from G5 experience) but also quite a different beast. I'm also learning that a full dismantle is about as involved you can get. Despite hating some of the screw placements, I am really understanding the detail and craftsmanship that went in to this case, and from a more informed position than simply modding the backside. Some might argue that the case is over-engineered, but in my mind it was done with excellence. Thanks for following! I'm waiting to hear back from David from The Laser Hive for his professional advice regarding the backplate before I make any cuts. More updates soon no doubt! Well, in the hopes that I can save the original fan grill, I decided to get started and hope for the best. The Mac Pro has a processor cage with the fan attached, so the grill doesn't have holes for mounting a standard fan. Now, as you can see from the following picture, I drilled the holes off center. There's a not-so-small possibility that I will have to remove part of the inner grill for motherboard clearance, and if that's the case, I don't want to have to drill again! motherboard clearance being all the stuff in the back I/O area on the MB I'm guessing? This is what is so far preventing me from installing the stock rear fans back into my G5. I don't need them for cooling, but it'd be nice to get those back in for originality sake. Yep, that's what I'm concerned about. Best case scenario, there's a mm or two - worst case scenario I shave off some of the interior fan grill and put some plastic to insulate from shorts. I know that SirKeldon kept his (you can find it on his gallery here) so it's definitely possible for the G5!